In 1898 artist Etta Hest purchased Esta, a small cabin to use as a summer home, located on Kenwood Hill in Louisville, Kentucky’s South End. 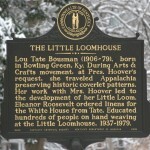 She originated the tradition of giving annual art festivals for local artists, writers, educators and others who had summer residences in the area. 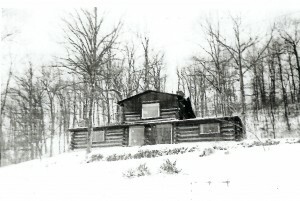 The cabin was built in 1870 by Beoni Figg when he acquired the land for his charcoal business and started a limestone quarry on the hillside. It originally consisted of just two rooms with vertical split log siding. Subsequent owners remodeled and enlarged the cabin. During one of the remodeling the siding was changed to the board and batten style. At the time other large log cabins were also built on the hillside for well to do families who wanted to escape the heat of the city. Among those were sisters Mildred Jane and Patty Smith Hill who were well known kindergarten and music teachers. They believed that songs were an important part of children’s education and composed many songs which they had copyrighted and published. In 1893 the Hill sisters had written a book called, “Song Stories for the Kindergarten”, which was published by Clayton F. Summy Co. of Chicago. The first song in the book was entitled “Good Morning to All”. 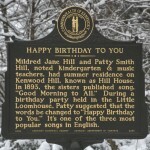 During a birthday celebration in Etta’s summer cabin, for her sister Lysette, Patty Hill suggested the words to this song be changed to “Happy Birthday to You”. Although the original song had been copyrighted the new lyrics were not until 1935. Under federal law at the time, the copyright would not expire until 75 years later- the year 2010. This meant that every time the song was used commercially, such as on stage or in singing telegrams, the royalty was twenty-five dollars for each performance. Patty Hill later moved to New York where she taught at Columbia University Teachers College. During the Hill sisters’ lifetime, they had trouble collecting royalties. Casio digital watches can be programmed to play the song every hour on the appropriate day. For this they pay a penny a watch. It is reported that most people who use the song for commercial gain pay the fee once they learn of the copyright. For many years the copyright was owned by Summy-Dirchard Music, the original publisher and was later bought by John F. Sengstick, a New York accountant who was head of Birchtree LTD. More recently his company was acquired by Warner Communicaions, Inc. Under a family trust arrangement, the sisters only surviving relative, Archibald A. Hill, a retired professor of Austin, Texas, collected $20,000 of each year’s royalties. It has been estimated that the copyright owners earn over a million dollars a year. According to the Guinness Book of World Records, “Happy Birthday” is one of the most popular songs in the English language. 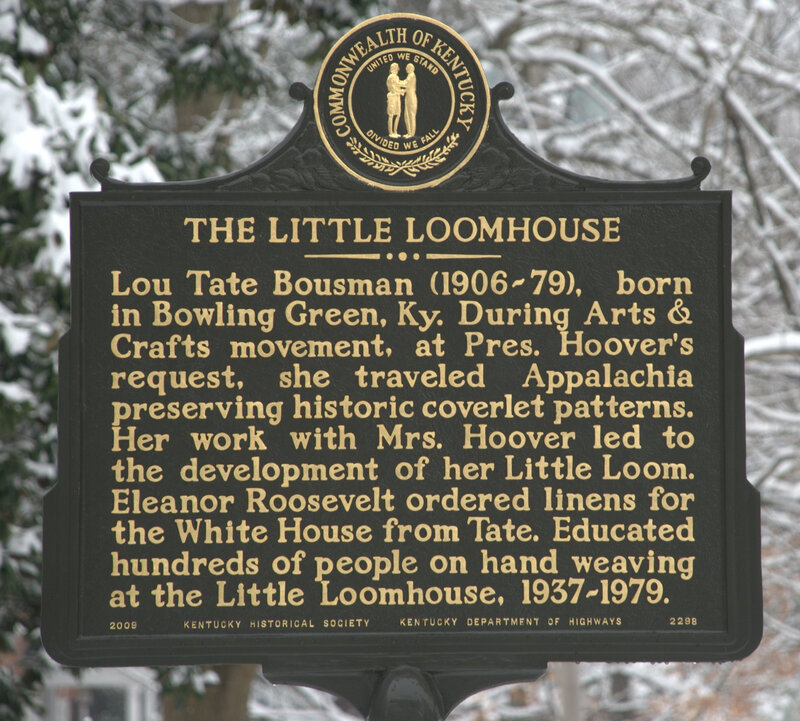 On October 16, 2009, The Little Loomhouse dedicated a bronze, historic highway marker commemorating Lou Tate and the Little Loomhouse and Mildred and Patty Hill and the Happy Birthday Song. The Marker is located in the flower garden at the intersection of Kenwood Drive and Kenwood Hill Road. It seemed only appropriate that the dedication took place on what would have been Lou Tate’s 103rd birthday.